Amazon truly disappointed me in this case. Abt Electronics advertised the TH-46PZ85U at a price of $1095 with free shipping, which seemed pretty good to me. I cashed in 19 Amazon credit card reward certificates and made plans to re-arrange the TV room. The following day, I get a cancellation notice from Amazon that offers no explanation and refers me to Abt electronics if I want additional info. Strange, no one wants to tell me what happened to the $475 in credit card rewards. So, no TV and, potentially, $475 in the hole. This was great. Perfect once it warms up!!! I have had this TV for about 3 weeks, and I have been up and down about it. Right at first I wasn't that impressed. Even on DishHD the picture just wasn't what I was expecting, but the more I watched, the more I liked it. I don't know if my expectations were just too high? The black levels are amazing on this TV and standard def, I think, is as good as or even a little better than my parents Samsung 46a750. Many people have complained about the speakers, but I don't think they are that bad, but I do plan on getting a surround system. 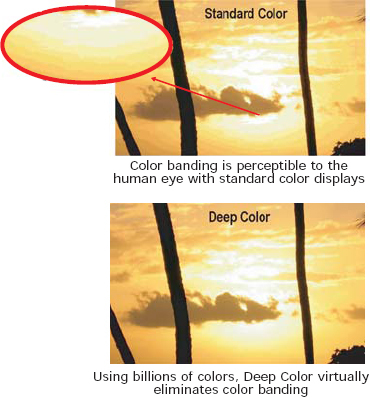 Panasonic says this TV "expands the available range of colors" so you don't get banding, but I have noticed quite a bit of banding, worse than my parents Samsung. I use the TV as my computer monitor, and have had no problems with burn-in. When I first hooked the computer to the TV I couldn't get the settings right. On text, it was dropping vertical lines which made it difficult to read, but I changed the setting from XGA to WXGA and that fixed it. I do not like the design of the remote. Most of the buttons are shaped the same and arranged in rows which make it hard to distinguish sometimes. I have memorized their placement, and can find the button I want without looking, but it is just not as easy as the Dish remote. It is nice having an SD slot on the side, but I would rather have a USB port. I have waited about a month and a half after receiving the TV before reviewing it to get a good read on it's quality and features. To summarize, I am very pleased with it and would not hesitate to purchase again. The colors are rich and and the excellent contrast ratio on this model allows super-deep blacks and the whitest or whites. I have watched many blu-rays on it and have been overly satisfied with the picture. If you are thinking about purchasing a plasma, nearly everyone will tell you that Panasonic is the way to go, and I can completely agree after comparing this TV with other brands I have seen. As for the plasma vs. lcd debate, that is much more of a personal decision. 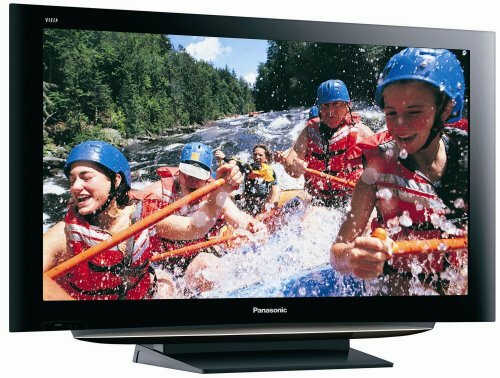 For the best picture quality, while ignoring other aspects such as size, price, power consumption, screen glare, and image retention, plasma seemed like the better choice to me, and without wanting to spend several thousand more on a Pioneer plasma, the Panasonic seemed like a great choice. Now, I am extremely happy I made that choice. The only downside I have come across so far is that the screen can be fairly reflective if a strong light is on in the background. This model really shines in a darker room though. Image retention on it has not been a problem, as technology on plasma's have improved to the point where it really isn't much of an issue anymore. Regardless, I did use a break-in regime where I kept the contrast levels low and avoided any stagnant pictures for the first 100 hours. This also might be a concern for anyone planning on using the TV for heavy gaming, even though it does have a "game mode", which is designed to prevent image retention and burn in. The TV itself is a nice piano black color and isn't nearly as heavy or thick as I expected it to be. Without reiterating the statistics of the TV, it has plenty of connections, including an SD card slot for pictures, and a PC connection. Great price, great product, great shipping. The TV itself has been great. Some reviewers have been disappointed by a lack of customer-accessible color tuning adjustments. If you're like me, that's a feature. The picture is great right out-of-the-box. If you want a TV you don't have to spend hours setting up, this is a good one. Other things I like: all of the inputs that I need. I have a TiVo, a computer, a home-theater receiver, and a DVD player hooked up. I appreciate the SD card reader, but usually use the connected computer for photos. I haven't used the internal speakers since it's connected to a receiver. Two wishes: I was surprised that there was only one antenna input. I still use analog cable TV as my primary input, but I also have an old amplified rabbit-ear antenna nearby for over-the-air HD (this is working great, by the way). I was stumped as to how to use both my cable coax and the rabbit-ears for a while, but ended up plugging the rabbit ears into the antenna input, and running the cable to the TiVo, and THEN to the TV. I think that's probably how it's supposed to go, but if you don't have a cable box or other intermediary device, you might have some figuring out to do. No picture-in-picture. No big deal for me, but I'd probably play with it if I had it. I've had the Panasonic TH46PZU for about three weeks, and I love it. The initial set up and programming was simple, the picture is clear and crisp, and the sound quality from the in unit speakers is a lot better that I had hoped for. When I have time to watch TV I just want to turn the set on, plop down on the sofa and enjoy myself. I'm not a video-phile who's going to spend a lot of time fiddling with a TV to get the ultimate experience, so I don't miss the extra fine tuning capabilities that others have mentioned. The Panasonic delivers everything that I want from a TV. Excellent picture. Seems to be a quality product, so far. The product is excellent. However, it didn't come until November 20th. This was very frustrating. I never had a flat screen anything until a year ago, when I replaced an old CRT monitor with a basic 19" LCD, so when we needed to replace a 1988-vintage 32" tube TV, we spent some time looking at and reading about HDTVs. 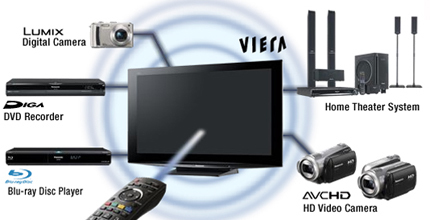 Undecided about LCD vs plasma,we ultimately went for a great value in the Panasonic Viera TH-46PZ85U. I was looking for the Pioneer which is currently the gold standard for plasma screens but could only accommodate a 46 inch screen (Pioneer does not make screens less than 50 inches now). For a lot less money, this TV is very close to the much more expensive Pioneer plasmas. I am very happy with this purchase and highly recommend it, especially for the price (I got it for $1049 delivered). Furthermore, the included delivery was great as the delivery guy took the old tube TV (very heavy) out of the cabinet and installed the plasma in its place. GREAT TV for the money! Considering I paid under 1250 for the TV, (tax and shipping included) this was a great purchase. I've bought many LCD flat panels and DLP projection TVs in the past and thought I'd try my luck with Plasma since it is losing popularity among manufacturers and as a result has been decreasing in price. I consider myself to be somewhat of an expert in being able to pick and choose television displays. I run a Home Theater website, have gone to numerous consumer electronic shows, and have been very critical in the type of display I choose for myself, family and friends. For the past few years I have owned a 1080p DLP display. This year my brothers and I wanted to buy our Mother her very first flat panel display. It was a very difficult choice as to what we should pick. Her living room is surrounded by windows and for that reason, I felt that an LCD display would be the better choice. LCD screens do not reflect light in the manner that plasma does. So, we went out and bought the Sony KDL-40V4100 40" LCD television (see my review on Amazon). Unfortunately, the display was defective out of the box and it had to be returned. I did have the opportunity to do a bit of viewing with the LCD and I was not particularly happy with what I saw. The LCD picture exhibited jagged motion and decreased quality when viewing from an angle. These are all problems inherent with LCD technology. We knew we had to exchange the defective set, and made the choice to go plasma instead, despite knowing there were a few drawbacks with that technology. It was my decision to go with Panasonic. Having attended consumer electronic shows year after year, I have had the opportunity to measure Panasonic plasma quality against other manufacturers. The best plasma displays come from Pioneer, Panasonic and Samsung. If you factor in price, Panasonic gives you best bang for the buck. 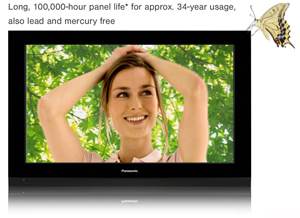 Their plasma displays offer superior quality at a price that will not break your pocketbook. We went with a 46" this time around, and picked up the TH46PZ85U. Setup of the the display took the efforts of two people. Weighing in at about 82 pounds, it's nearly impossible for one person to assemble the stand, slide it into the bottom of the display and then place it on a stand or wall. The display is very attractive with its black piano finish. Within a day we noticed that this baby is a dust magnet. It will be necessary to continually clean it in order for it to keep its sheen. A small cleaning cloth is included in the box. The TH46PZ85U offers 3 HDMI inputs which is more than enough to hook up a cable box, DVD/Blu-ray player and whatever else you wish to add. By far, plasma displays are the best choice for overall picture quality. 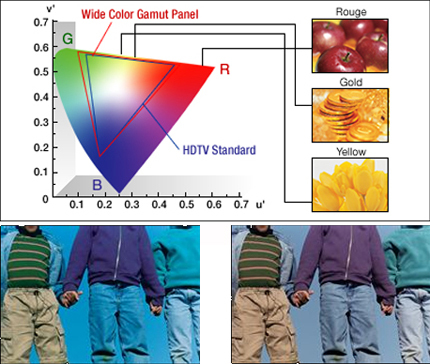 They offer better color reproduction and saturation as well as deep blacks, which give the picture texture. LCD displays don't come quite as close. If this purchase was for me, I would have immediately picked a plasma. The big reason we decided not to pick plasma as our choice of display for our Mother, was the fact that plasma displays have to babied. You need to take careful steps in order to prevent any long-term damage. For the first 100 hours of use you need to bring down the picture and brightness levels considerably. Put the display in CINEMA MODE with PICTURE and BRIGHTNESS at 50 or less. You also need to mix up your television watching not letting the display sit for hours on material with black bars on the top and bottom or sides. Doing this will prevent any possibility of "burn-in." After the initial 100 hour break-in you can bring up your picture levels again. Television manufacturers claim that "burn-in" is no longer a problem with plasmas, but it does pay to stay on the side of caution. You can do a GOOGLE search to learn more about plasma "burn-in." So, let me get to the meat of this review and talk about the picture quality of the TH46PZ85U. detailed painting. I never got that feeling watching LCD. Since we were not hooking the TH46PZ85U to a surround system, we relied on the built-in speakers which offered remarkably full audio. The advanced sound settings allows you to tweak the treble and bass levels, with an optional bass booster setting. Sound was quite good, though as I applied more bass the audio became distorted at louder levels. Reflection on a plasma display can be a problem. I did find when watching the Panasonic at night that all lights in the living room needed to be off if we didn't want to catch a distracting reflection. During the day, sitting in a room surrounded by windows, we did get get lines on the television from sunlight creeping in through open blinds. These are factors you should consider when picking plasma over LCD. The Panasonic display does have an anti-reflective screen which works fairly well for daytime viewing. Honestly, I suppose the reflections we saw could have been far worse. We were easily able to watch television during the day without being distracted. Having the ability to view LCD and PLASMA in my home was a huge learning experience. I learned that LCD is perfect for those that don't want the hassle of having to baby their display, and having a hugely bright picture in their sunny room without the fear of reflection. The only downsides to LCD is its ability to handle fast moving motion and decreased quality at certain viewing angles. If you want the very best quality that these type of flat panel displays offer, you want to go PLASMA. Hands down, they offer rich, natural colors with deep black levels. The only downsides are reflection and the fact that caution must be taken in the way you watch television. As good as I hoped. Extremely happy with my purchase of this tv from Amazon both service / delivery and the performance of the TV are excellent. I was one of those people that had been watching prices of this Panasonic Viera TH-46PZ85 and the Samsung LN46A650 for a long time. I DO NOT REGRET in the least bit choosing the Panasonic over the Samsung. Don't believe all the negative marketing LCD fans, Samsung and Sony are shoving out there about Plasma TVs. Do the research, Burn-in is a thing of the past and even the recommended 'break-in' isnt even necessary. The white glove service was great, my TV showed up THREE DAYS after I ordered it! That was 4 days earlier than expected, the driver unboxed everything, turned it on and let me check to make sure everything was to my satisfaction and it was. No bad pixels or anything. I am sure this television will look beautiful once it is set up and configured, and I acknowledge that I should probably not give this item one star due to service related to the purchase of this item. That being said, DO NOT ORDER THIS TV FROM AMAZON.COM based on the promised "White Glove Delivery". Knew what to expect and still amazed! 1) Plasma technology is still better than the best LCD. All this LCD 120Hz, and everything else they throw in is to try to get to the plasma level. Also plasma contrast ratio vs LCD is not even close, where LCD loses. 2) The price difference was about $400 less when compared to an LCD that I would buy only if forced to do so. This Panasonic is crisp, great colors, great blacks and the right number of inputs for all the components I will hook to it. I was worried about the heat, and it turns out my computers 30inch Dell LCD monitor puts out more heat than this thing. It is surprisingly cool. I need one more flat panel, and no question would buy this or its close cousins again. It is everything I expected. Found the best price here. Wonderful images. Had it a month now. 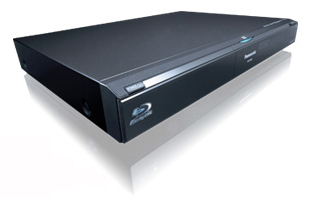 HDMI cable is best way to go with a blu ray player. I have compared/researched other models. The 46 is the smallest home theater system I recomend. Panasonic has great track record and quality. These are heavy mothers/ If you plan to wall mount, get some help.